Our commitment to producing innovative, reliable and inspiring musical instrument amplification for nearly 50 years finally includes the incredible world of acoustic instruments! The Rosette® Combo combines thoughtful design with the highest quality components, materials and construction to deliver a new standard of detail and clarity in acoustic amplification. 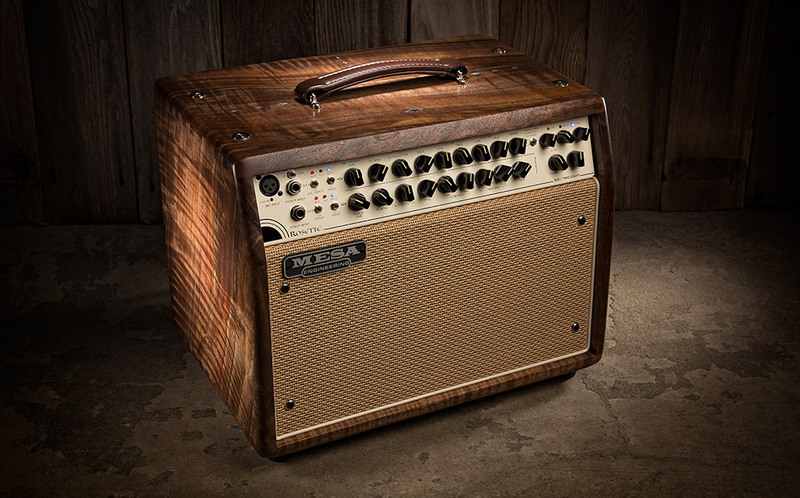 Handbuilt in Petaluma, California, the Rosette combo is a compact and powerful 30 lb., 300 watt amplifier that offers ample headroom and accuracy while being dedicated to delivering your acoustic instrument’s true tone. The Rosette Series is designed not just for acoustic guitars, but also for vocals, ukulele, mandolin, dobro, violin/fiddle, cello, upright bass, and and other uniquely acoustic instruments. The Rosette combo features two highly versatile channels and 300 Watts of power via a lightweight Class D power section driving two 8” custom neodymium speakers. At only 30 lbs., gigging musicians will appreciate the ability to easily transport the Rosette between home, studio and gigs. Feature packed with MESA®’s optimized input circuitry, the Rosette offers two full-featured channel strips perfect for amplifying any acoustic instrument. Professional features include two input stages for both channels that include channel specific XLR and ¼” inputs, optimized to address common tone degradation issues associated with compromised dual-purpose circuits fed by universal combo jacks standard on many acoustic amplifiers today. For tone shaping, a 4-Band EQ provides a level of tone control one would expect in high end recording or live sound consoles. The Rosette’s on-board Effects Suite includes three options: REVERB + CHORUS, ROOM REVERB, and HALL REVERB, with parameter controls for adjustment of specific effect functions in each of the three FX modes. An FX BYPASS feature provides footswitchable bypass of the internal effects and/or any external effects that may be inserted in the FX LOOP. A HEADPHONE Output provides personal monitoring, with or without the combo speakers connected, and a studio-quality DIRECT OUTPUT are among the many professional features on the Rosette’s rear panel. The Rosette’s depth of tone and frequency control place the new acoustic amp in a category beyond standard acoustic amps and more aligned with the best of high-end pro audio gear. Recorded with various guitars and instruments into the MESA Rosette® Combo and mic’d with a Royer Stereo XY, an AEA R44 Ribbon Mic, and the Rosette Channel DI’s. Mixed with approximately 40% Royer, 30% AEA and 30% DI with occasional compression leveling via UAD 1176 at 20:1 and mastering for optimized levels. Next Post Tone Sessions: JP-2C™ / 2x12 Rectifier® – John Browne – "Melancholia"